Year zero, the dawning of a new era, call it what you will, it is a quarter of a century since the Premier League burst into life, revolutionising football, writes PHILIP BARKER. It made England a magnet for the biggest stars in the world. Bergkamp, Gullit, Klinsmann, Suarez and Zola have all left their mark. The game had been on its uppers, with a European club ban imposed in 1985 following the riots which led to 39 deaths at the European Cup final between Liverpool and Juventus. For UEFA it was the final straw. A couple of weeks earlier 56 people perished in a fire at Bradford City. Four years later 96 innocent Liverpool fans died at Hillsborough. Football was in a dark place. Everything changed after Italia 90. It was hardly a classic World Cup but England reached the semis, Gazza cried and the sport was cool again. 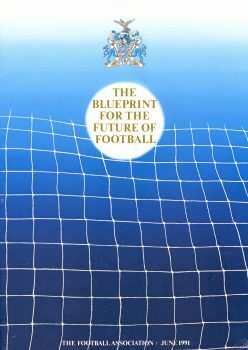 The following year came the Football Association’s 119 page Blueprint for Football which called “for the establishment of a premier league within the administration of the Football Association”. Chief executive Graham Kelly described it “a landmark in the history of football” and said the new league would “end the constant power struggle between the Football League and the FA” while there would also be “considerable commercial benefits”. In those days, BBC and ITV ruled the television roost but Sky Sports won a bidding war for exclusively live rights. The fee was an eye-watering £304 million. “It’s the most exciting opportunity that I’ve yet seen for the sport to develop a real partnership with television,” said FA Premier League chief executive Rick Parry. The Simple Minds hit ‘Alive and Kicking’ provided the soundtrack for a famous promo, entitled A whole new ball game. It was perhaps the first acting job for Vinnie Jones and the most polite team talk ever given by Peter Reid. Giant advertising billboards featured a composite team group of all the Premier League captains. When Jones was transferred, cameras filmed him as a billposter complete with wallpaper paste making the necessary adjustments. The flagship preview programme was Sky Soccer Weekend, presented by Paul Dempsey. If they’d given airmiles for motorway travel, chief reporter Nick Collins would be a millionaire by now. Each week the closing titles listed fixtures and ticket availability. On Saturday August 15 1992, Sheffield United’s Brian Deane scored the first Premier League goal against Manchester United. The following day came the first Super Sunday. Voiceover man Bruce Hammall intoned: “Yes we’re alive and kicking with the hot shots of Nottingham Forest taking on mighty Liverpool, it’s Clough against Souness in the battle of the giants”. The badges of the two sides crashed against one another with sound effects. The cameras swung across the Trent to depict “a sporting tradition stretching all the way back to Robin Hood”. Presenter Keys wore a grey blue Sky blazer resplendent with huge breast pocket logo. Keys would later don coats of many colours, by Yves Saint Laurent. Reporters were kitted out in special all-weather snowgoose jackets. The build-up to the big match lasted hours but for unimpressed former BBC Executive Paul Fox it was Sleepy Sunday. The Guardian’s David Lacey wrote of “nothing more than a costume drama working from a borrowed script”. Brian Glanville soon described the whole enterprise as “the greed is good” league. Monday Night Football made its bow at Maine Road. Manchester City took on Queens Park Rangers, described in the Telegraph as “reluctant participants in soccer’s revolution”. Unhappy that QPR might be forced to play three times in a week, Gerry Francis called for the match to be rescheduled, saying “there will be saturation coverage and it will end up like snooker”. QPR’s disaffection was soon forgotten as the teams emerged through an avenue of “Sky Strikers” (aka cheerleaders) and fireworks. Half-time intervals included attractions such as giant Sumo wrestlers. When The Shamen performed at Highbury, commentator Ian Darke wondered whimsically if they’d be better off at Halifax (nickname: The Shaymen). Support programming included The Bootroom with Andy Gray and his tactics board. There was the Footballers’ Football Show while Soccer AM garnered a cult following. All the goals were shown from multiple angles in Netbusters. Jeff Stelling’s unique Soccer Saturday came later in the decade. In 1992, Sue Barker and Sally Gunnell introduced a sporting miscellany called Sports Saturday. The first quarter century has indeed revolutionised television coverage. 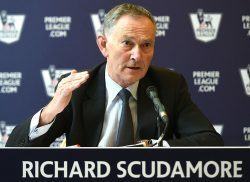 Premier League supremo Richard Scudamore now makes regular media appearances to extol the very considerable financial well-being of his organisation. He has become a household name, unthinkable for a sports administrator even 30 years ago. There is, however, one objective of that 1991 blueprint that remains unfulfilled. That’s a whole new debate… maybe another day? Nice article as always, Philip, but Scudamore “a household name, unthinkable for a sports administrator even 30 years ago”? Sir Standley Rous might beg to differ, and Graham Kelly certainly would post-1985.